Our Journey started from Hyderabad (also called Hi-Tec city) on 15th Oct 2012. Actual program was about attending an Interview at Bangalore. We booked a bus ticket from a private travels. To my goodness, they allotted us in an A/C bus, instead of super deluxe. Sharp 8:05PM started from Miyapur-Hafeezpet junction. Ours is the first pickup. After picking up all other others and to exit Hyderabad outskirts it was almost 10:50PM. How ever the head ache was finished the next day. Now suddenly planned for trip, may or may not come again to Bangalore. And also after marriage we haven’t went any place to visit. So, we booked a package with a private travel agent. 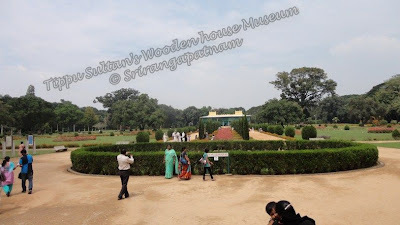 Sri Rangapatnam - First destiny of tour and entrance to city of Mysore which is 19 KM away from main city, we have entered through Fort walls which are similar to Golconda fort of Hyderabad. 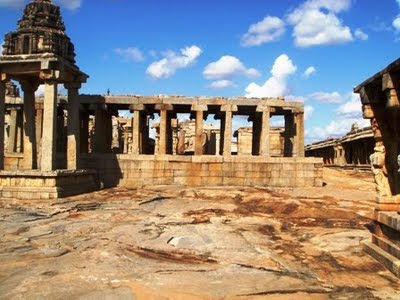 More than a historical place, Its an Island surrounded by river Cauvery (Kavery), River divides into to ways and a land formed between them is Sri Rangapatna also known as Adi Ranga. There are other two similar Islands of Sri Ranga. Antya Ranga in Tiruchirapalli district of Tamilnadu. 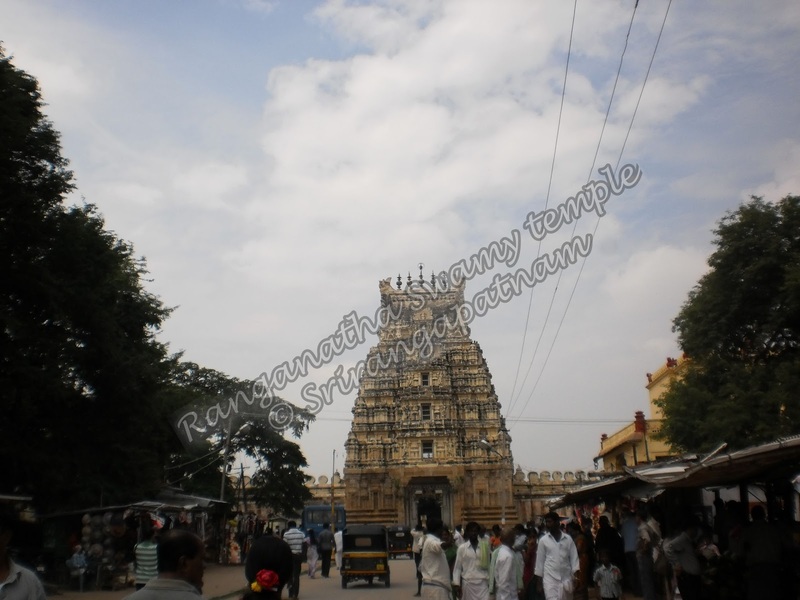 Each of these Places has a Very historical temple of Sri Ranganatha Swamy (Form of Lord Vishnu). Temple was built by Ganga Dynasty rulers Raja Odeyaar kings during 9th Century AD. During Tippu sultan’s period it was the main center and recreation place for him. 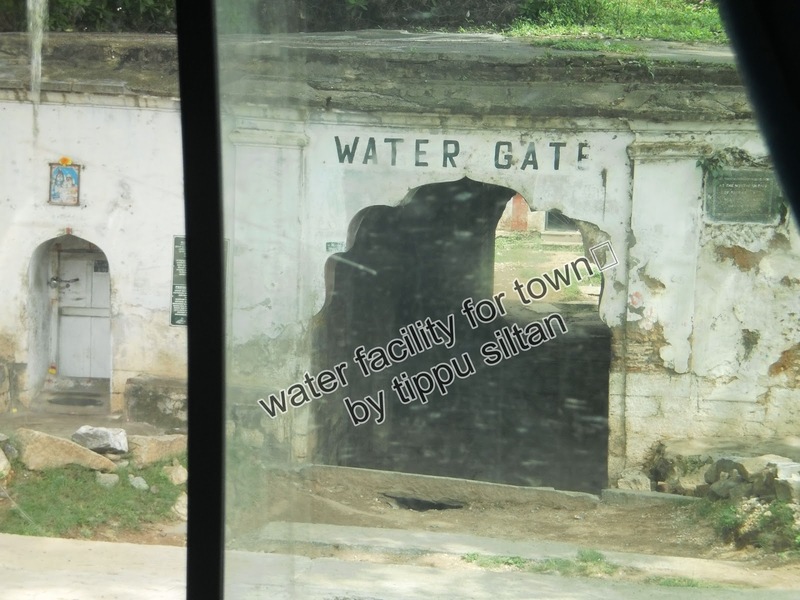 There is a water gate way for the people of Tippu sultan’s kingdom for their daily needs, also lord Shiva temple. Many stalls installed with various arts-crafts made of sandal wood by local people. 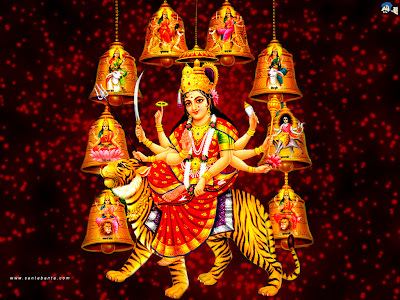 There are nine forms of Goddess durga matha. Below mentioned are list of goddess forms. 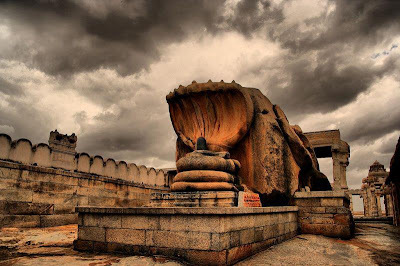 Lepakshi, is a historic town and a mandal in district of Anantapur - Andhra Pradesh state. Located at 120 km away from Bangalore. 16 km from the left side of the road on Bangalore-Hyderabad Highway. 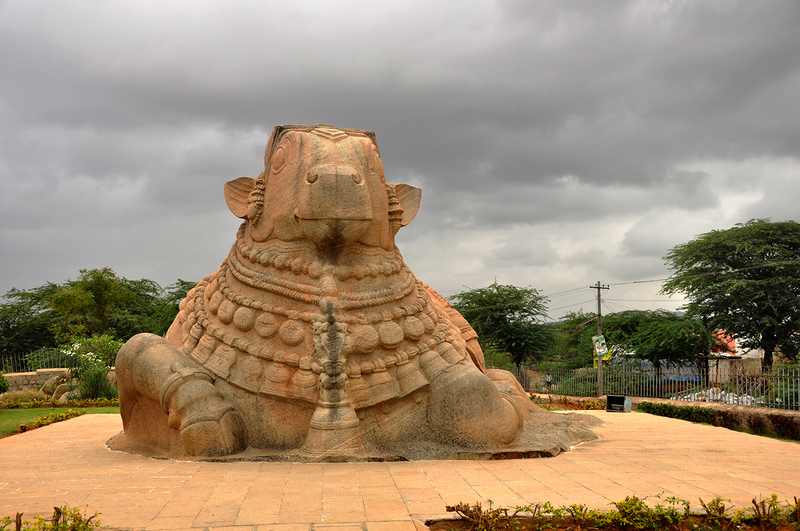 The largest monolith statue of Nandi (Lord Shiva's Vehicle/Pet) is in this garden, in an urban accession style of Olympia sitting posture. Just 200 m. away from here a Shiva temple is located, the arts embedded here are of the middle ages of an ancient Indian style. Lord Shiva statue seems to be about thirty feet height is encircled with a snake in outdoors. Fine architecture of pillars, arches, and many historical sculptures are found here. 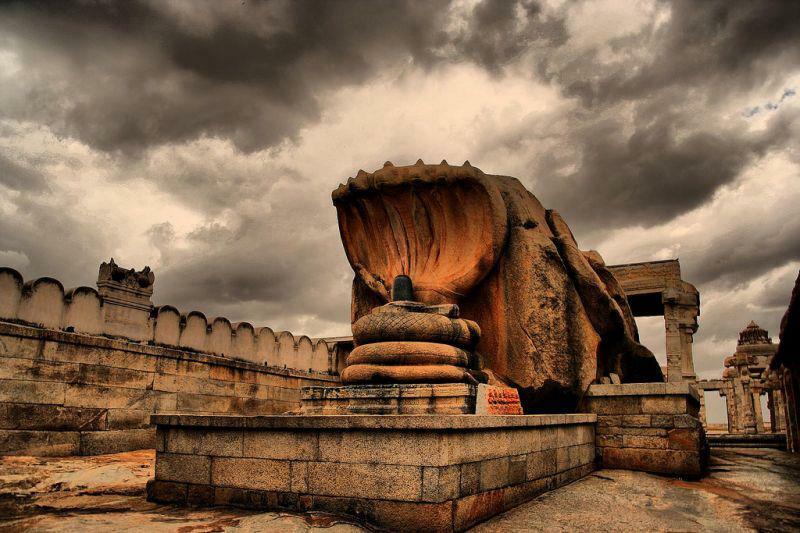 It is still worshiped by the people surrounding areas, in this temple there are a number of small and medium sized shiva lingas. The temple has a moderately large campus is beautiful and the temple is placed in center. 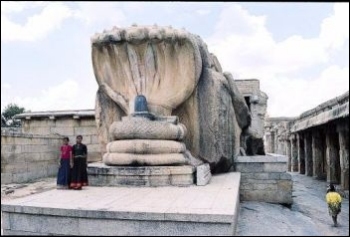 Lepakshi Lord shiva temple with huge Naga encircled. There are many special features of the temple remains unknown. There is a statue of Durga Devi on mast of MoolaVirattu Veerabhadhra Swami temple. 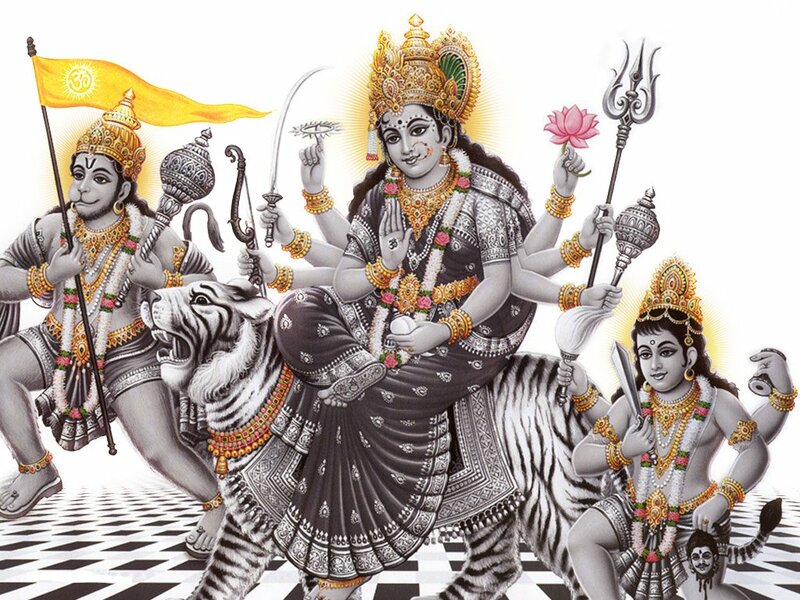 Usually, God appears from outside through the main doors of Temple, Swami is Ugra (Anger) virabhadhra, so doors are little bit side of the entrance to the temple so that eye contact shouldn't directly falls on to the town. Kalankari images were excellent on the roof in the temple. 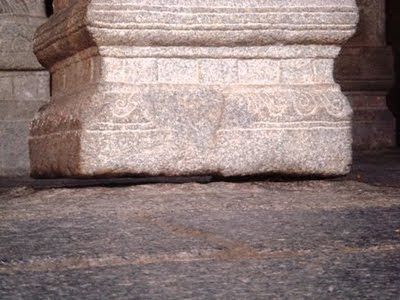 The main attraction of the temple is, one can move a towel cloth under the pillar built in temple. This is a great example for engineering technology implemented during long back in India. This is just example of Indian History. 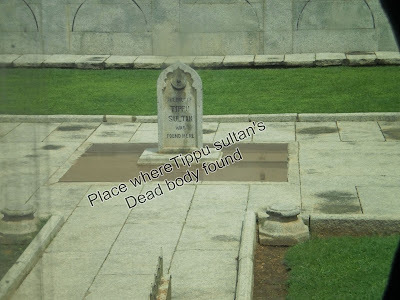 There are many unknown mysteries in India. Know them, save the Greatness of Indian - Subcontinent. As we all know India has many Natural Resources and wealth. A country proved as King of Agricultural products. In every aspects of natural wealth, India has its own mark. A country where people work hard for their living as well as their pets like cow, buffalo, even trees. Also they worship them as gods and serve them like their children. A farmer who grows various products to sell them will form a syndicate and choose a place and selling value for the products. They sell them and make their living at reasonable values. The consumer who buys them will be satisfied by the quality and quantity of the product. Farmers follow Rotational Crop format so that soil will be fertile long time. For ex: If farmer chooses to sow groundnut this year, next year he chooses some other crop like cotton, corn etc. so that fertility of soil remains in a stable position. Each Agricultural term has its uniqueness, let’s take paddy as example. Rice grains is a product as we use in our daily life, rice by crushing can make flakes, the grass and brown layer above rice can be used as rich protein food product for cows, buffalo, horses etc. but these days technology made people mad and just plucking rice grains from crop and again harvesting for rice. These are affecting the food habits of pets and imbalances. As per the tradition, grass and other left over products which are feed to cows makes them healthier and gives good quality of milk. Breaking the rules of nature and changing the logic's affecting us today as shortage of milk. There are many such examples, resulting in natural imbalances. Believe it or not Deforestation today lead to increase in mosquito population. Silly to be in thoughts but fact, here are many such factors making the life of many living things in Endangered. Sparrows the friendliest birds are almost at peak stage of Endangered.